At nearly twenty feet wide and nine feet high, Emily Kwame Kngwarreye’s painting Earth’s Creation is monumental in its scale and impact, rivaling Abstract Expressionist masterpieces by Willem de Kooning and Jackson Pollock not only in size but also in its painterly virtuosity (see a photo of it in a gallery here, to get a sense of its scale). Patches of bold yellows, greens, reds and blues seem to bloom like lush vegetation over the large canvas. Comprised of gestural, viscous marks, each swath of color traces the movement of the artist’s hands and body over the canvas, which would have been laid horizontally as she painted, seated on (or beside) and intimately connected to her art. The work made records at auction when it was sold in 2007 for over $1,000,000—the highest price ever fetched for a work by a female artist in Australia. Yet, just decades earlier, Kngwarreye was virtually unknown to the world outside her small desert community in the Australian country of Alhakere. A self-taught artist who was trained in ceremonial painting, she rose to international prominence only in her eighties, and enjoyed a flourishing career at the end of her life. 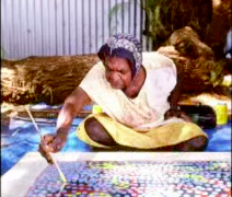 Kngwarreye was born around 1910, and spent most of her life in an isolated Anmatyerr community in Central Australia. The area, however, was forcibly occupied by European pastoralist settlers in the 1920s, and the artist, alongside other members of her community, worked on the pastoral property (pastoral refers to the tending of cattle and sheep). In 1976, Aboriginal land rights were legally granted, and she was able, finally, to live independently. Aboriginal culture has long been intimately connected to the landscape of Australia; inhabited by humans for over 40,000 years, the region is characterized by deserts, grasslands and dramatic arched rock formations. 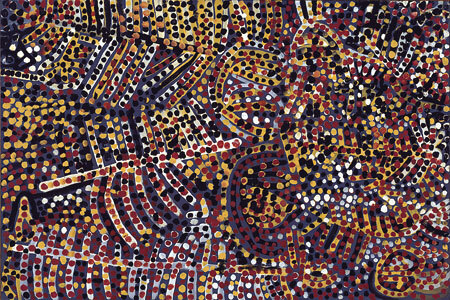 Kngwarreye was an established elder of her community and was trained to create ceremonial sand paintings inspired by her ritual “dreamings,’” as well as to paint decorative motifs on women’s bodies as part of a ceremony called Awelye. These visual forms were connected to cultural expressions in song, storytelling and dance. While her paintings have never been figural, they remain influenced by the culture in which she grew up as well as the natural environment. In the late 1970s, Kngwayere began to work in the medium of batiks, making works that were purely artistic endeavors for the first time. In 1977, she was a founding participant of the Utopia Women’s Batik Group. Her compositions were abstract and featured the motif of repeated dots, acting sometimes as a linear stroke, or elsewhere used to fill large patches of space. A decade later, in 1988, the S.H. Ervin Gallery in Sydney initiated a “Summer Project” that sought to facilitate the creation of Aboriginal art, as well as to establish a market for the genre. Sponsored by the collector Robert Holmes à Court, curators traveled to the Aboriginal homeland of Utopia and delivered acrylic paints and materials. After two weeks they returned to find “abstract and richly expressive” compositions created by many of the artists, and held a group exhibition in Sydney. Kngwarreye’s painting Emu Woman (above) was selected for the cover of the exhibition catalogue as a gesture of respect for her seniority, as she was the oldest artist from the community. Dominated by rich, earthy tones, the painting—her first ever on canvas–contained references to plants and seeds that featured in her “dreaming” ritual. Against a dark field of charcoal, violet and black, the piece is punctuated with bright marks in tangerine and white hues, which lend the work an electric sense of energy and rhythm. Her decades-long experience in painting directly on the human body informs the curving swells of dotted marks that comprise the composition. Critics lauded the piece, and virtually overnight, the artist received international exposure and unprecedented acclaim. The following year, Kngwarreye held her first solo exhibition at Utopia Art Sydney, after which she would be invited to participate in several renowned international exhibitions and biennales. The arc of Kngwarreye’s career runs alongside a period of tremendous change in Australia, moving from the end of a phase of colonial settlement through to a more ethical embrace of Aboriginal culture by the nation’s Western population. Yet the period in which she came to prominence also reflects changes taking place in the contemporary art world internationally, as the 1980s and 1990s saw a notable expansion within the mainstream to include non-Western or minority artists. Earth’s Creation belongs to the “high colorist” phase in Kngwarreye’s work, which is characterized by a loosening of her compositions—which were no longer reliant on pseudo-geometric patterns—and the expansion of her color palette to include a range of tones beyond the familiar clay and ochre hues that dominated her prior works. Still connected to the natural environment, however, these works reference the changing atmospheric character of seasonal cycles. Earth’s Creation documents the lushness of the “green time” that follows periods of heavy rain, and makes use of tropical blues, yellows and greens. The piece has often been likened to Claude Monet’s studies of seasonal and temporal change, and given its formidable, room-filling scale, a comparison to the artist’s Water Lilies of 1914-26 (MoMA) might be remarkably apt. Earth’s Creation was created as part of the larger Alhalkere Suite which contains twenty-two panels, and is still considered one of the most virtuosic of Kngwarreye’s immense and prolific artistic output. In the last two weeks of her life, Kngwarreye completed a suite of twenty-four small paintings. These were characterized by extremely broad, milky strokes of jewel-toned hues of blue and rose, and communicate the artist’s long-standing fascination with color and her sophisticated grasp of abstract composition. Cite this page as: Dr. Allison Young, "Emily Kame Kngwarreye, Earth’s Creation," in Smarthistory, February 6, 2016, accessed April 19, 2019, https://smarthistory.org/emily-kame-kngwarreye-earths-creation-2/.